This correspondence serves to introduce you to your diagnosis-related group (DRG) coder. While you are probably more familiar with those who bill for your professional services, you should be aware that there exists a separate staff of clinical coders who translate your medical documentation into the numerical language of ICD-9-CM for hospital claims. This information is encoded according to complex rules that determine the sequencing of diagnoses and procedures and other rules that could decide no codes are necessary because they are a normal component of another disease or procedure. Medicare payments to the hospital for each inpatient stay are determined by the combinations of these codes. They explain why the patient needed to be admitted, other conditions that affected patient care during the current encounter, and the procedures performed while the patient was in the hospital. This payment system is utilized by other payers, including Medicaid, military claims, and many commercial entities—and every bit of it is decided by your documentation in a patient’s chart. At this point, you may be tempted to dismiss the rest of this introduction as irrelevant. After all, you’re a physician and while you prefer that the hospital remains open for business, you probably believe that what coders code and how they do it is of no personal or financial concern to you. Please be patient a little while longer and you may discover another rewarding professional relationship outside of your normal operating area. 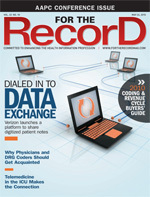 While the DRG coder does analyze and juggle dozens of government coding and sequencing rules for hospital reimbursement, it is a significant faux pas to think the effect on physicians is minimal to nonexistent. While the connection may not be immediately apparent, there can be serious impact to your own publicly reported patient demographics and even to your bottom line. • The Basics: The hospital must bill correctly to receive payment and therefore stay in business so that you have somewhere to practice medicine. This is oversimplification, of course, but if a facility is not financially sound, it cannot provide the advanced technology you would like to use nor will it have the necessary staffing to best serve you and your patients. Today’s patients have access to Internet report cards for hospitals and physicians. They browse prices of elective procedures and seek out information on physician reputations. If they don’t like what they find at your hospital, they may not choose your services either. • The Risk: If a hospital’s DRGs are abnormal compared with similar facilities and demographics and Medicare and Medicaid begin auditing its claims, your billing practices are likely to come under scrutiny as well. Professional billing and hospital billing won’t always match because you bill daily under some different rules and codes and the hospital sends one claim summarizing the entire stay. However, if the basic information submitted by each is too disconnected, then you may become the target of an audit, too. Currently, federal auditors are focusing mainly on facility billing because the return on investment is more impressive, but that does not offer you a great deal of security should the hospital data create red flags that direct attention to your doorstep. Is your office billing for an inpatient level of care when the hospital received an order for only observation services? Different codes = red flag. Is your coding staff billing a significantly higher or lower level of procedure code or evaluation and management code than the hospital? Higher = red flag. Lower = lost revenue. And whose is correct? • The Data: It is the DRG assigned by your hospital coder that sets the expected length of stay for each patient. The codes that determine the DRG also justify the severity of illness and risk of mortality levels reported in nationally published data for hospitals and physicians. Are you concerned that your patients’ average length of stay is greater than the median in your area for any particular medical problem? Perhaps it isn’t poor care management but rather nonspecific documentation that has landed your patients in DRGs with less average lengths of stay than you would expect for the severity of their illnesses. Take time to contact your hospital’s lead DRG coder and find out whether there are any general observations about how you can improve the detail in your charts to correctly describe your patients’ acuity. Chances are that even a few documentation tips will significantly improve your overall patient data. By developing communication lines to your hospital’s DRG coding department, you will learn when a coder has questions about vague or conflicting documentation. Your timely response to clarify documentation may or may not improve hospital payment, but it will certainly help ensure that your patients’ data will correctly reflect their true illness severity and mortality risk. You will be pleasantly surprised at the level of clinical knowledge found within a quality DRG coding team. The coders must be able to read physicians’ handwriting unless the chart is totally electronic; that in itself deserves accolades of some sort. For those who code from a true EMR, the legibility portion is given some relief. In its place is the expectation to read through duplicates of copy/paste labs and prior notes to try to find the one sentence that might have been changed and will subsequently modify the encounter’s DRG. Experienced DRG coders will have a good understanding of not only the language of medical coding and the rules governing its use, but they will also be well versed in anatomy, laboratory tests, medications used to treat the most common ailments, and the tests used for diagnosis and prognosis. They will understand complex medical and surgical terminology as well as their most common abbreviations, both legitimate and of questionable parentage. For example, AKI: acute kidney injury or acute kidney insufficiency? Other typical competencies are comprehension of interventional radiology procedures, discharge expectations and transferring facilities, and even some level of psychic abilities. What? Was that a typographical error? No. Today’s DRG coder also must be extremely intuitive nearly to the point of clairvoyance to identify more than what exists in a chart’s medical documentation. The best will also recognize what isn’t in a chart but probably should be there—abnormal lab results, symptoms without diagnoses, procedures performed without an explanation of why the service was needed. And they will be able to carefully phrase a question so as not to imply they are making your diagnoses for you. Instead, they will respectfully encourage excellence in documentation. DRG coders must also have the balance of high-wire artists. If they’re a little too aggressive in their queries, they risk physician ire and/or the wrath of recovery audit contractors. If they are too timid or tired of unresponsive practitioners, they risk leaving millions of legitimate dollars unbilled for lack of clarity in a chart—your chart. Invest a little time in your own continuing education. Ask your secretary to make an appointment so you can speak with your hospital’s coding manager. Ask what you can do for them and what they can do in turn for you—and be sure to tell them you were already introduced informally by a friend in the business.